My Curriculum Vitae in pdf form. Dr. Wismath received his Ph.D. in Computer Science from U.B.C. in 1989. He obtained his B.Sc. (Hons., Mathematics) with a minor in Computing Science in 1975 and an M.Sc. (Computing Science) in 1980 from Queen's University. He is a Professor Emeritus and taught primarily computer science courses at the University of Lethbridge since 1983. He took a turn as Chair of the department, finishing June 30, 2009. I've been a runner for over 50 years and have completed 7 marathons and numerous shorter races (mostly 10 mile and 1/2 marathon distances recently). I also play go regularly and avidly. No further teaching duties! Ever. Here are some projects generated by my students in the Computer Graphics course recently. Currently, the main focus of my research is examining the nature and structure of visibility among objects in the plane and determining efficient and practical algorithms for such problems. More recently, graph drawing in three dimensions has been of primary interest. In general, my research can be categorized as: Analysis of Algorithms, Computational Geometry, Graph Drawing, Visibility Graphs. I gratefully acknowledge NSERC for their support of my research. I was invited to give a talk at Graph Theory with Altitude in May 2005. I was invited to give a course on 3-Dimensional Straight-Line Graph Drawing at the Journees de Geometrie Algorithmique 2002 held in Obernai, France, Oct 14-18, 2002. Program Committee cochair (with Alexander Wolff) for Graph Drawing 2013 held in Bordeaux. Canadian Conference on Computational Geometry 2009 held in Vancouver. Graph Drawing 2008 held in Crete. the 19th Canadian Conference on Computational Geometry held at Carleton University (Aug. 2007). Graph Drawing 2005 held in Limerick Ireland in September 2005.
the 17th Canadian Conference on Computational Geometry held at the U. of Windsor in Aug. 2005. The 2004 International Conference on Computational Science and its Applications (ICCSA2004) held in Assisi, Italy in May, 2004. Graph Drawing 2003 held in Perugia, Italy September 21-24, 2003. Canadian Conference on Computational Geometry 2003 held in Halifax in August, 2003. The 2003 International Conference on Computational Science and its Applications (ICCSA2003) held in Montreal in May, 2003. Graph Drawing 2000 held in Williamsburg, Virginia, Sept. 20-23, 2000.
the 12th Canadian Conference on Computational Geometry held at the U. of New Brunswick in Aug. 2000. LillAnne Jackson -- graduated in 1996. Thesis: Polygon Reconstruction from Visibility Information. Elspeth Nickle -- graduated in Fall 2005 Thesis: Classes of Arrangement Graphs in 3D. Sebastian Hanlon -- graduated in Spring 2006. Thesis: Visualizing 3D Graph Drawings. Andrew Butcher -- cosupervised with Matt Tata (Neuroscience) -- graduated Spring 2012 Thesis: Free Field Auditory Localization and Perception. Joel Bennett -- cosupervised with Kevin Grant -- graduated Fall 2014. Thesis: Voxel Octree intersection based 3D scanning. Farshad Barahimi -- graduated Summer 2015 Thesis: Web-based drawing software for graphs in 3D and two layout algorithms. In the last several years, I have hired the following students to work on research projects: Helen Pinto, Michael Closson, Breanne Dyck, Shane Gartshore, Ray Dufresne, John Johansen, Jill Joevenazzo, Jon Wilsdon, Kim Hansen, Sebastian Hanlon, Carrie Wang, Ethan Kim, Garret Johnson, Amy Smith, Ian Stewart, Fei Wang, Lezar DeGuzman. 3D Graph Visualization with the Oculus Rift with Farshad Barahimi is a poster accepted and presented at Graph Drawing 14. Animation of an Algorithm for Drawing Graphs in 3D with Lezar DeGuzman is an animation accepted and presented at the Symposium on Computational Geometry, 2014 in Kyoto, Japan It comes in both a 2D and a 3D version. 3D Printed Graphs with GLuskap (with Joel Bennett) was a poster accepted and presented at Graph Drawing 13. 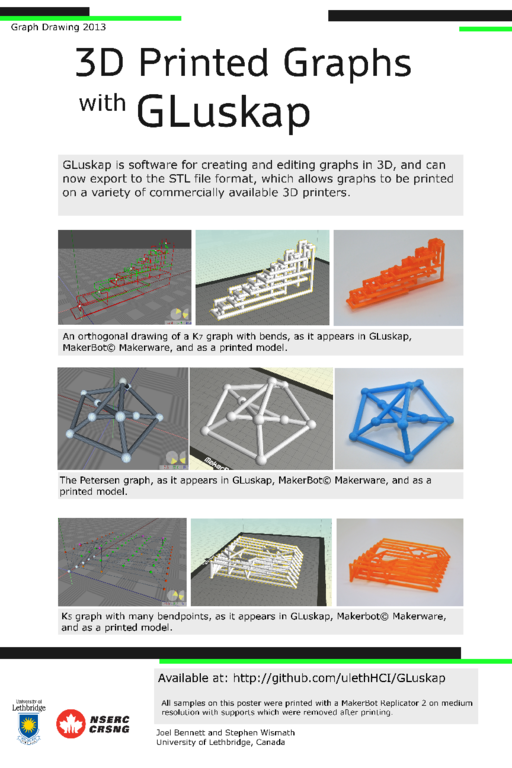 The GLUSKAP (version 3.0) package for 3D graph drawing is now available. An earlier version was presented as a poster at Graph Drawing 2003. Using this software we entered the graph drawing contest associated with the GD03 conference and tied for 2nd place. Our entry includes 2 animations and a stereogram poster. An animation (by Carrie Wang with some post processing by Kim Hansen) is on upward drawings of trees in 3D and was entered in the Graph Drawing 2005 freestyle contest. We have several other projects on the go. See this web site for various projects. An animation on drawing planar graphs produced by my student Kim Hansen was accepted and presented at the Symposium on Computational Geometry 2005 Multimedia and Video session in Pisa, Italy, in June 2005. Some more animations and pictures describing a paper on drawing planar graphs on curves is available both in English and Italian! In the Summer of 2002, I had 2 students working for me on upgrading the packages described below and making some lovely animations related to 3d graph drawing. One project of interest to researchers in visibility graphs is the VisPak package of visibility algorithms written here at the U. of Lethbridge under my supervision. My students have also written a package for manipulation of arrangements of lines and pseudo-lines (ArrangePak) and a package for 3-d orthogonal drawing of graphs (OrthoPak). This software is freely available for research and teaching purposes. You may download the PACKAGES. An applet displaying the Z-planes of a 3-D orthogonal drawing of K100 is available that displays some joint work with T. Biedl, T. Shermer, and S. Whitesides. 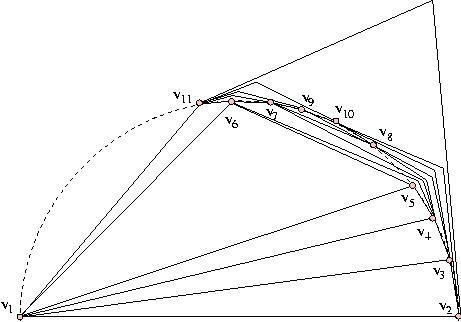 An applet implementing an algorithm for determining an inducing path of length n in a set of lines can be viewed - joint work with J. Bose, and H. Everett. The following is an animated gif of some work on 3d graph drawing. Can you identify the graph? Note that the electronically available papers are for personal use only, and in some cases copyright rests with a publishing company. An alternate research summary with pictures is also available. Proceedings of the Symposium on Computational Geometry, Baltimore, 1985, pp. 147-152. Proceedings of the Workshop on Algorithms and Data Structures, 1989 Ottawa, Lecture Notes in Computer Science 382, Springer-Verlag, pp. 325-334. Information Processing Letters, 42, July 1992, pp. 257-261. 4th Canadian Conference on Computational Geometry, 1992 and technical report UL-CS-92-02. Computational Geometry: Theory and Applications, Vol 6, No. 2, May 1996, pp. 99-122. See also: Math Reviews Oct. 97. Journal of Graph Algorithms and Applications , (special issue on new trends in Graph Drawing) Vol. 3, No. 4, 1999, pp. 63-79. University of Lethbridge Technical Report TR-CS-01-98, 1998. Int. J. of Computational Geometry and Applications, Vol 10, No. 5, Oct. 2000, pp.535-552. Int. J. of Computational Geometry and Applications, Vol. 10, No. 2 (2000) pp. 189-200. Journal of Graph Algorithms and Applications, Vol 5, No. 2, 2001 pp. 1-34. [ Accepted and presented at Graph Drawing 99, September 15-19, Prague. Springer-Verlag Lecture Notes in Computer Science 1731, pp. 49-58, 1999. Computational Geometry: Theory and Applications, Vol. 23, No. 1, pp. 69-83, July 2002.
in (special issue) Journal of Graph Algorithms and Applications, Vol. 7, no. 4, pp. 363-398, 2003. [ Accepted and presented at Graph Drawing 2001 in Vienna, Sept.23-26. Springer-Verlag Lecture Notes in Computer Science 2265, pp. 328-342. Vol 13, No. 6, Dec. 2003, pp. 447--462. [Presented at 14th European Conference on Computational Geometry, Barcelona, Spain, March 1998. A preliminary version was accepted and presented at CCCG02 , August 12-14, 2002. Dyck, B.; Joevenazzo, J.; Nickle, E.; Wilsdon, J.; Wismath, S.
Poster/demo accepted at Graph Drawing 2003, September 2003, Perugia, Italy. University of Lethbridge Technical Report #CS-01-04, January 2004, pp. 2-7. University of Lethbridge Technical Report #CS-02-04, July 2004, pp. 1-21. The ArrangePak3D software is available for download. University of Lethbridge Technical Report #CS-03-04, October, 2004, pp. 1--28. The GLuskap software is available for download. Honorable mention at Graph Drawing 2004 freestyle contest, New York, Oct. 2004. Springer-Verlag LNCS 3383, pp. 514--515. Computational Geometry: Theory and Applications, Vol 30, No. 1, Jan 2005, pp. 1-23. Animations and software are available at the Web site . [Accepted and presented at: WG2003 29th Workshop on Graph Theoretic Concepts in Computer Science, June 2003. Accepted and presented at: Symposium on Computational Geometry (Video, Multi-Media session) , Pisa, Italy. Proceedings of the 21st Symp. on Comp. Geom. (ACM), June 2005, pp. 374-375. Int. J. of Computational Geometry and Applications Vol 17, Issue 4, August 2007, pp. 297--304. Journal of Graph Algorithms and Applications, Vol 10, No. 2, pp. 287-295, 2006. Algorithmica, Vol 45, No. 4, Aug. 2006. pp. 531--547. Journal of Graph Algorithms and Applications, Vol 12, No. 1, pp. 29--49, 2008. Computational Geometry: Theory and Applications, Vol 42, Issues 6-7, August 2009, Pages 664-676. Discrete and Computational Geometry Vol 43, No. 2, March 2010, pp. 272--288. DOI: 10.1007/s00454-009-9149-3. S. Stolpner, J. Lenchner, G. Liotta, D. Bremner, C. Paul, M. Pouget and S. Wismath. Accepted and presented at Cdn Conf on Comp. 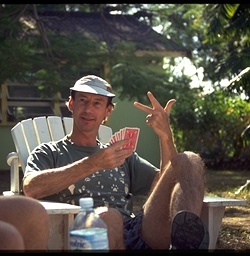 Geom 08, Montreal, 2008. Int. J. of Computational Geometry and Applications Vol. 20, Issue 5, Oct. 2010, pp. 577-600. [ Accepted and presented at: WALCOM2009 India]. Accepted and presented at Graph Drawing 2010, Konstanz. Computational Geometry: Theory and Applications Vol. 46, Issue 1, pp. 29--50, Jan. 2013. [ Accepted and presented at: Graph Drawing 2011, Eindhoven. Algorithmica Vol. 71 Issue 2, pp. 233--257, Feb. 2015. [ Accepted and presented at: Graph Drawing 2014, Wuerzburg. See the supporting web site. Accepted and presented at Latin 2016. Computational Geometry: Theory and Applications, Vol 72, pp. 19--33, June 2018. Graph Drawing 2016, Athens, Springer-Verlag Lecture Notes in Computer Science Vol. 9801. Discrete Mathematics and Theoretical Computer Science Vol. 20, No. 1, Jan. 2018. Theoretical Computer Science 713, pp. 78--84, 2018.